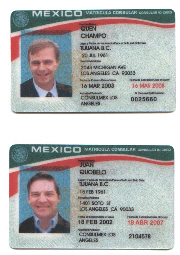 On May 15, 2002, you interviewed Ex-Cop L.A. Councilman Dennis Zine on the Mexican Sham ID called the Matricula Consular. I listened to that interview and can tell you that Zine, doesn't know what he's talking about. Here are some facts about the Matricula Consular IDs: There is no fingerprint requirement, there is no criminal background check done by either the LAPD or the Mexican Consulate, there is absolutely no way for the LAPD to do a "make" on someone using the card. Zine says that the IDs give government the opportunity to verify the identity of the card carrier. But as stated, there is no way to verify the information on the card. An illegal alien criminal who arrived last week has no criminal history on file in the U.S. -- and the Mexican government does not keep a national database on criminals -- and even if they did, they wouldn't share it with U.S. law enforcement anyway. The IDs are so unreliable, that a Mexican fugitive who already has a valid California driver license could easily get a new identity by obtaining a Matricula and using it instead of the valid license. I have tried in the past to convince Zine that it would be a mistake to promote Matriculas by provided him with two editorials I wrote on the subject:, one to the Daily News, and the other to the L.A. Times (see attachment 1 & 2). Zine refuses to address the issue in logical dialog. Instead, he repeats the mantra that he has 33 years experience as a cop and knows better than I (more like one year experience 33 times). From the interview, Zine says that illegal immigration is a Federal issue and indicates that he doesn't want any part of it. But he's OK when the city virtually makes its own immigration policy by negotiating with a foreign country. In January of 2003, I wrote to the LAPD's Discovery Unit requesting information under the California Public Information Act, about the six month pilot program of the Matricula ID. 1. During that six months, how many persons were cited for infractions whose only form of identification was the Matricula Consular ID? 2. During that six months, how many persons were arrested whose only form of identification was the Matricula Consular ID? The LAPD answered me saying that the Matricula ID pilot program was NEVER tested (see attachment 3). When Zine told you that the card would go through a six month pilot program to test it, he must have known that no such test was going to occur. From a personal do-it-yourself investigation, I can tell you that fake Matriculas are being sold daily in the open in the MacArthur Park area while black-and-whites drive by uninterested. There are many reasons why Latinos would want to buy a fake Matricula. Some Mexicans from small villages never had a birth certificate. Others simply don't have one handy. And for the same price, you don't have to waste the whole day standing in line at the Mexican Consulate. The process is so simple, that Mexican fugitives and deadbeat dads can instantly receive a new identity, compliments of Dennis Zine and cabal. Zine says that the Mexican government has a series of checks and balances. Zine would not elaborate as to what those "checks and balances" are -- because there are none!. The Mexican Consulate says that the new improved cards are counterfeit proof because of the new hologram now embedded in them. The fake card's hologram may not reproduce 100 % accurately, but it takes an expert to tell the difference -- and untrained LAPD cops are not experts. But if a Mexican or anyone who could pass as Mexican wanted to get the "real McCoy," they only have to obtain an easily forged Mexican birth certificate. Then they could go into the Mexican consulate and "prove" that their nationality was Mexican. They could also go to another consulate using another forged birth certificate and get another Matricula with the same photo but different name. Then they could go to some of the many banks that honor Matriculas and open several laundering accounts. Zine says that the City of Los Angeles decided a number of years ago that they would not cooperate with the INS. Zine is mistaken. He is talking about Special Order 40. Special Order 40 is a police mandate. It is not a law decided by city legislative action. All "Special Order" mandates can only be created, amended, or repealed by the Chief of Police. The LAPD only needs a directive from Chief Bratton to LEGALLY get rid of over 60 % of the gang members overnight. And the Chief does whatever Zine and the council says they want him to do. Zine's problem is that he doesn't want to offend his colleagues, especially the Latino ones. But Zine should consider the safety of his constituents over his politics. Sheriff Baca's own study shows that 23 percent of the county jail inmate population are illegal aliens who should have been deported before they had a chance to commit their crimes (see attachment 4). Instead, Zine wants to make it easy for new criminal arrivals. Moreover, every one of those illegal alien Hispanic inmates upon being freed, can obtain a new identity by obtaining a Matricula. Most Americans like myself like immigrants -- even illegal ones. There is no question that beyond breaking immigration law, most illegal aliens are not criminals. The problem is the LAPD has no way to tell the good illegal aliens from the bad ones. Intentionally or not, Zine wants to reward criminal behavior. I decided to find out how difficult it would be to obtain a counterfeit Matricula Consular ID for myself, so I went to Wiltshire Blvd and Alvarado Street in the MacArthur Park area where I quickly made contact with a fake ID vendor. Concerned that since I have blond hair and blue eyes, I would be asked what I needed the card for, I was prepared to answer that I wanted to play a joke on a Mexican friend of mine. But the vendor asked no questions -- he was only interested in the $40.00 I paid ($40.00 Gringo price -- normally $30.00) for the card. Are you ready for this: My contact prefers that in the future, I deal with him via U.S. mail. It is only necessary to send a photo and $40.00 cash to his P.O. mailing address and a Matricula is returned by mail. He says it's not as risky for him as dealing in the street. You needn't be concerned about describing me by name or how I acquired the Matriculas to your listeners. My research indicates that there is no Los Angeles ordinance which prohibits anyone from possessing a Matricula anymore than there is an ordinance to posses monopoly money. It is only against the law to use a Matricula card (or any ID) to falsify your identity. I thought the two of you would like to have your own Matricula IDs, so I had one made for each of you as well.